Page 4 - Play Today | KaBOOM! The earlier we start making these investments, the better. 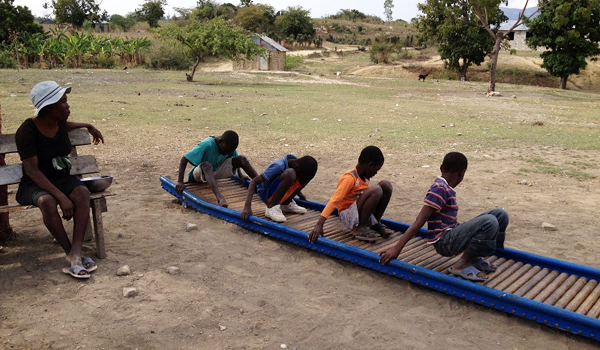 According to UNICEF, “Early childhood represents a unique window of opportunity for investing in children’s cognitive and physical development.” While these investments should cover a wide range of needs, there is one need we often overlook: play. 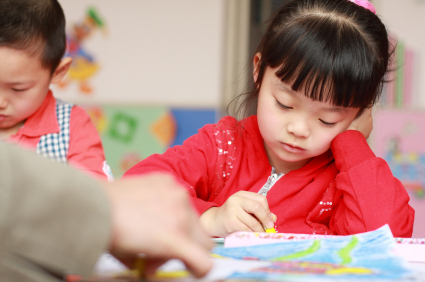 We often hear about the successes of Chinese and Japanese students, who earn top science, reading, and math scores in the international PISA exam, but less discussed is their “playful and experiential… approach to schooling before second grade.” Even in later years, many students in China and Japan received short play breaks every 50 minutes. As this research indicates, early childhood education represents a critical window for giving children access to play opportunities. It’s no coincidence that the five countries that top the chart in UNICEF’s recently released report, Child Well-Being in Rich Countries—The Netherlands, Norway, Iceland, Finland, Sweden, and Germany—are all countries that make substantive investments in high-quality, play-rich daycare and preschool opportunities. But do these investments pay off? According to Science Daily, a longitudinal study revealed that "for every $1 invested in a Chicago early childhood education program, nearly $11 is projected to return to society over the children's lifetimes." 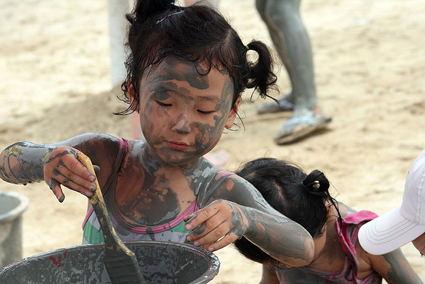 Around the world, play opportunities are disappearing, and countries are paying the price. Literally. Society pays the cost of remedial help, public benefits, medical care, and even incarceration. Meanwhile, we are hindering our world’s next generation of innovative thinkers and business leaders. Most tragically of all, our children are missing out on the childhood they deserve. Depriving them is a grave moral failure—and one that we simply cannot afford. Photo by Smaku (cc). A version of this post originally appeared on the World Economic Forum blog. In the tornado-ravaged town of Moore, Okla., all people want is for things to return to “normal.” What does “normal” mean? Adults no doubt crave the comfort of their own beds, a running refrigerator, a hot shower. But for kids, “normal” might be as simple as a chance to play. In the wake of disaster, we must meet our children’s basic needs – food, shelter, water – but it’s not enough. 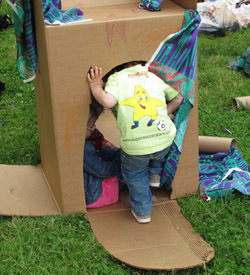 For children whose lives have been turned upside-down, play is absolutely essential for maintaining a sense of stability amidst turmoil and helping them to work through emotional trauma. That’s because play is simple, familiar and joyful – all the things that adversity is not. The psychologists in our area have been doing studies on kids in the schools in our district, and they reported seeing things… like thoughts about suicide, murder and other types of violence – truly terrible things. But, they also reported that they didn’t see those things in the kids at North Central Elementary and they attribute a lot of that to the playground. Similarly, when KaBOOM! joined forces with the town of Joplin, Missouri to build a playground there 16 months after a tornado devastated the area, Superintendent of Joplin Schools CJ Huff noted that talk of suicide decreased. 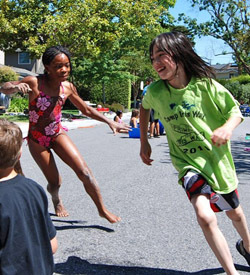 "Playgrounds are a critical component to the infrastructure in any community," he said. "We also found playgrounds were really a place of reunification in the aftermath of the tornado and a meeting place for children who hadn’t seen each other since the storm." Back in 2006, KaBOOM! supported a playground-building effort at Plaza Towers Elementary School—one of the two schools demolished by the tornado. 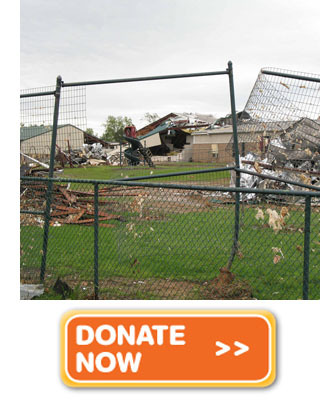 As we work on a long-term plan to contribute to the rebuilding efforts of Plaza Towers and the town of Moore, let’s support the organizations on the ground that are seeking resources to address the community’s immediate needs. Save the Children is coordinating a response effort for affected children and families; please support its worthy efforts by making a donation today. It’s all too easy to forget that kids bear the stress of their families: lost jobs, lost homes, lost lives. Getting outside and having the opportunity to run, laugh, and play is essential—because all children deserve a childhood. Even when faced with trying external circumstances beyond our control, it is our responsibility to ensure that they don’t miss out. Will you leave your children at the park? Clearly we are in the middle of a vicious cycle—there are no kids outside so I won’t let MY kids outside, so there are no kids outside, so you don’t let YOUR kids outside, so I don’t let MY kids outside, etc., etc., etc—which is why the holiday (or whatever it is) is even necessary. It is a day to break the cycle. 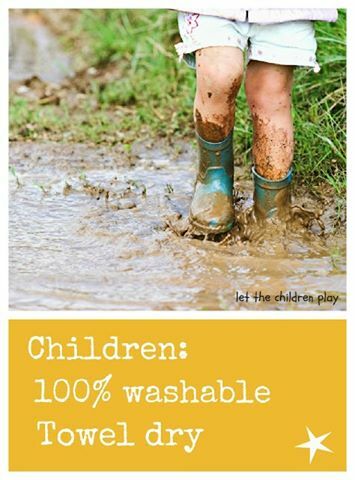 A day to get kids outside to meet each other and re-learn the lost art of playing! Stand around, get bored, wonder what to do, wish there was an Xbox around, feel hungry, feel a little too hot or cold, feel mad at mom for not organizing something "really" fun, like a trip to Chuck E. Cheese, feel bad all around, realize the other kids are feeling bad too, and then—in desperation—do something. Start a game of tag. Or basketball. Or fairies versus witches. And suddenly, those bored kids who were desperate to go home don't want to go home at all. They want to KEEP playing— with any luck, for the rest of their childhoods. So why are no parents allowed? For years, Lenore has been on a mission to prove that the world is not as dangerous a place as many parents are led to believe it is (crime rates are actually back down to where they were in the early 70s). Without granting our kids the freedom to... well, be kids, we are depriving them of vital chances to develop life skills. For instance, learning how turn boredom into opportunity and becoming self-sufficient. May 18 is tomorrow. Will you be taking your children to the park… and leaving them there? Learn more about the day here. 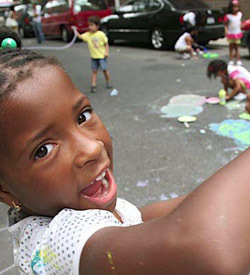 Our vision is a playground within walking distance of every child in America, but if we had our way, the same would one day be true for every child in the world. 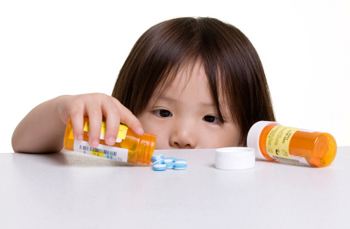 The play deficit is not a uniquely American problem. “As a Peace Corps Volunteer, my first project was to survey local neighborhoods to determine local needs and possible projects. As I went from home to home, I noticed that there were often young children inside, watching television or playing games indoors, even though it was summer and the weather was absolutely gorgeous. "I was puzzled by this and asked why. I was told there was no safe place for the children to play outside, and homes here are built side by side, with little or no yard. I collaborated with Angel Garcia, my community partner and San Luis Parks and Recreation Director, to write a grant proposal, which was approved by the Mayor and town council. Dozens of my friends contributed the $1200 donations, which the Municipality matched with land, labor, transportation and materials. 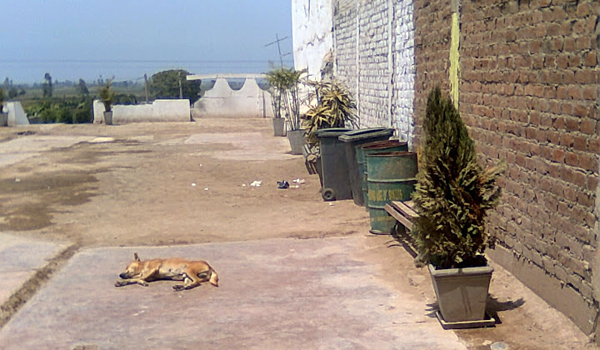 A dog naps in the space where a playground will soon be built. 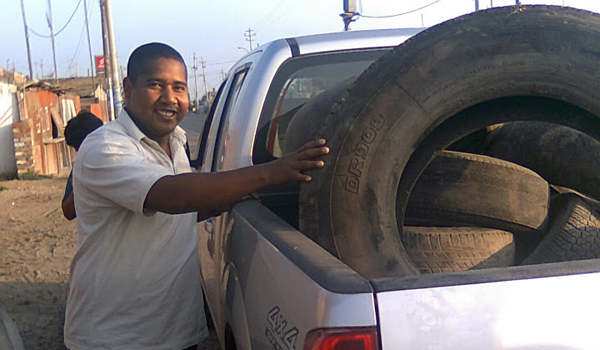 San Luis Parks and Recreation Director Angel Garcia collects used tires that will soon be transformed into playground equipment. 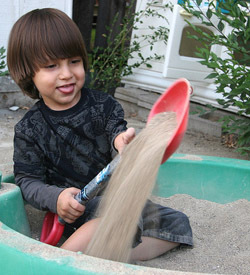 Volunteers help fill the retaining area with beach sand. 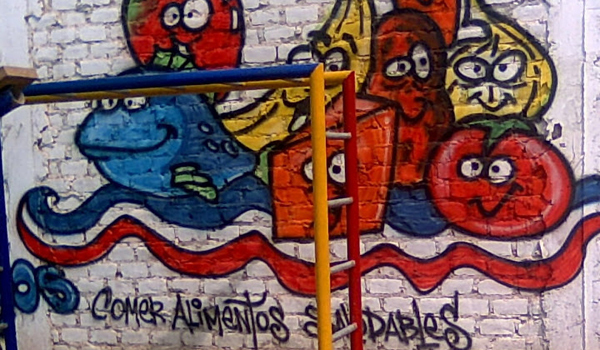 Local artist Sam Lucho advises children to "eat healthy foods" in a mural next to the playground. 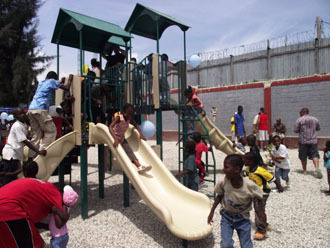 Children flock to the new playground. "Even in the hot mid-day sun, with no water to drink and no shoes on their feet, the children play football with abandon. They play with balls that are made up of rags tied together. They play with old soccer balls that have no outside leather left, and no air in them—deflated bladders so that balls just barely roll. They play on the beaches; on the stone streets in Stonetown; on thorny, patchy fields that double as cow pastures. The goals are made up of sticks, PVC pipes, even coconut tree trunks. "The children imitate the moves of their soccer heroes—Messi, Ronaldo, Mata, Van Persie, and other global soccer superstars. Someone calls a foul, and one child studiously paces off the 10 meters from the free kick. The 'Beautiful Game' helps these children be healthy in unhealthy circumstances. It allows them time to feel good and experience joy, to bond with teammates. Playing soccer helps them learn and follow rules of the game. It builds self-esteem and teaches them to treat each other with respect. "Mubarak Mambud, the tireless Director of Save the Children, Zanzibar, speaks of how much more attentive and productive children are when they have time to play. Having access to a ball in school even reduces truancy and decreases behavior disruptions in school." "My favorite part of a playground build was playing with the children. 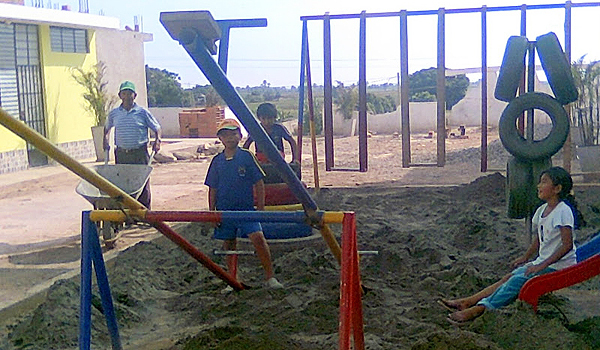 As we worked on building the play structure, the children always gathered around to watch. I took jump ropes and soccer balls along so I could play with them. By the time the playground was dedicated, I already knew a number of the children. There are no words to express the emotions I felt when those children scream with glee and laughter running towards the playground. I have grown to live by this quote: 'I do for one, what I wish I could do for all.' "
No need to wait until the play equipment has been assembled! Children play on what will be a slide in the site of their future playground. Volunteers get to work assembling the playground. Building a playground is hard work! Children swarm over the new play equipment. In the United States, a project of this size would normally cost between $225,000 to $250,000. The budget for this project was $50,000. Who can resist a swing? 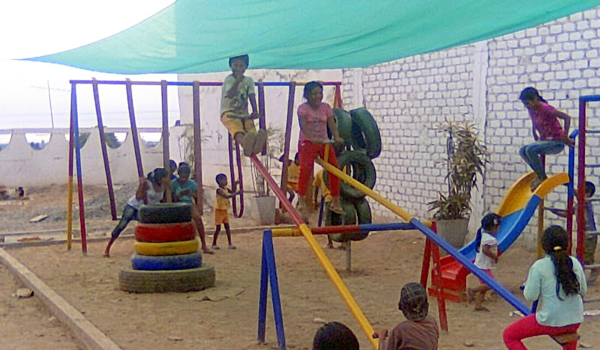 Children are all smiles on their new playground. Here’s one complaint we frequently hear from families: “All the playgrounds look the same.” They’re right: Many neighborhood playgrounds offer a similar array of equipment, in similar styles and colors. No wonder our kids get bored. 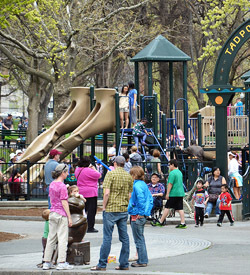 The truly unique playgrounds, where a family might easily wile away an afternoon, tend to be concentrated in downtown areas and require hefty budgets. 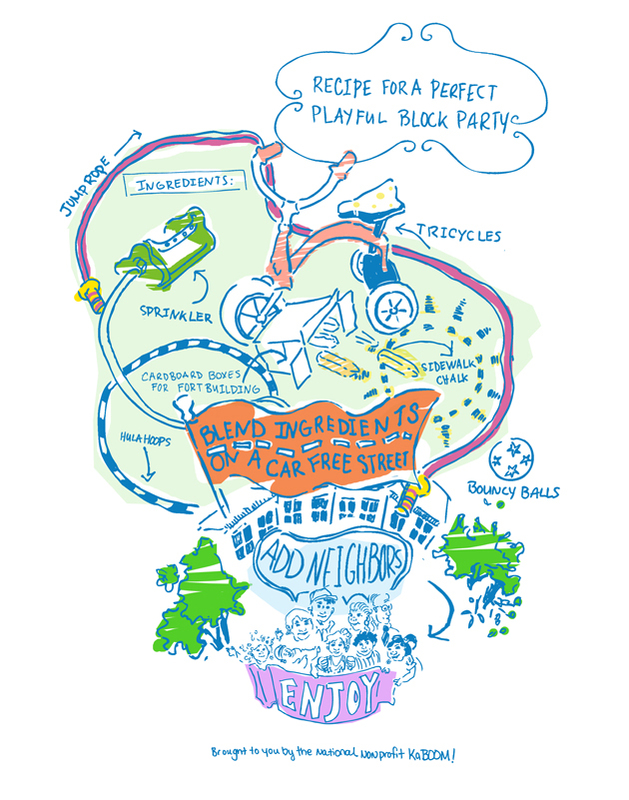 So how can we bring the thrill, ingenuity, and whimsy of these destination playgrounds to the neighborhood level—without breaking the bank? This playground in Stavanger, Norway is made of recycled materials from oil rigs. Photo via Abstract Noun. This section of Stavanger, Norway's oil rig playground makes use of old plastic buoys. Photo via Abstract Noun. 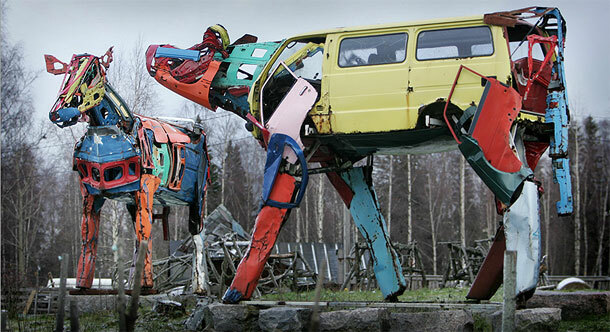 Helsinki-based sculptor Miina Äkkijyrkkä specializes in building giant cows out of old car parts. Photo via Artrick Playground. 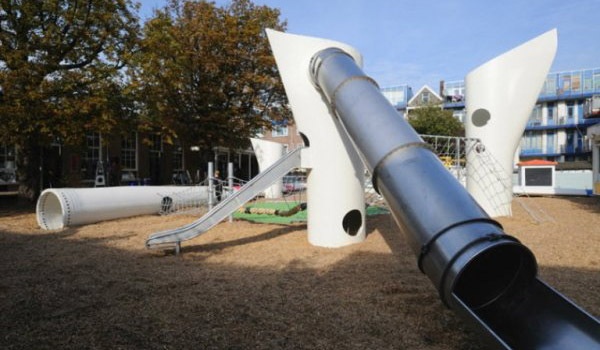 The Wikado Playground in Rotterdam, Netherlands is made from old wind turbine blades. Photo via The Coolist. 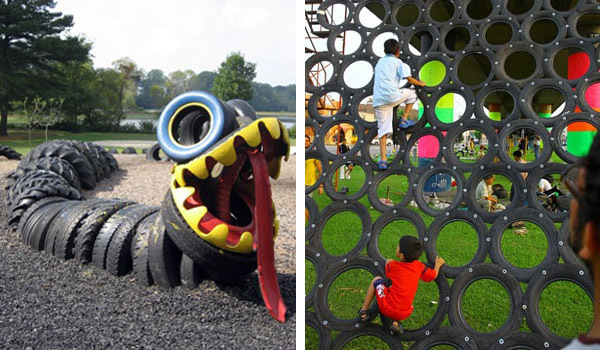 The possibilities for incorporating old tires into playground structures are almost endless. Photos via RelaxShacks.com. 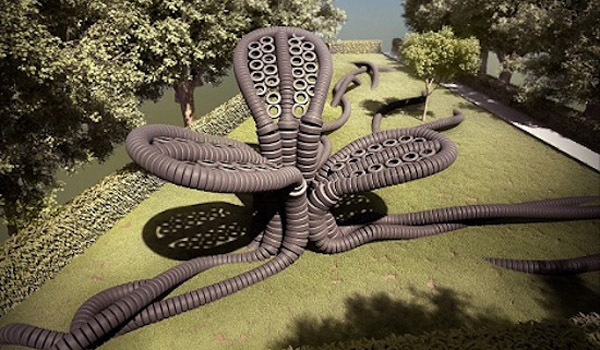 OK, this playground isn't real, but if Dutch artist AnneMarie van Splunter gets her way, it might be someday. Photo via Grist. 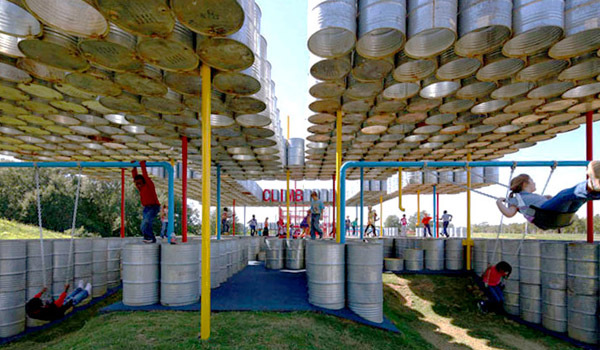 Lions Park playground in Alabama is made from 2,000 recycled steel drums. Photo via Inhabitat. 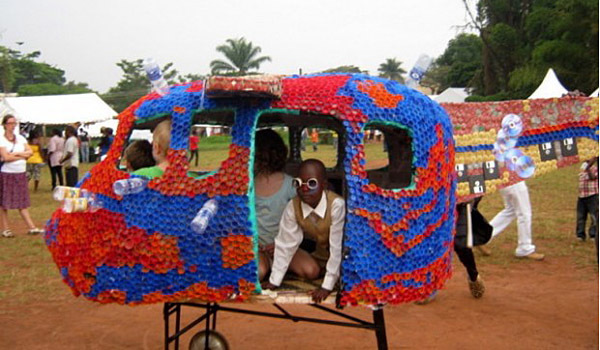 Ugandan Artist Ruganzu Bruno Tusingwire is refashioning water bottles into play structures. Photo via Clutch. Skinners Playground in Melbourne, Australia makes use of old shipping containers. Photo by Inhabitat. 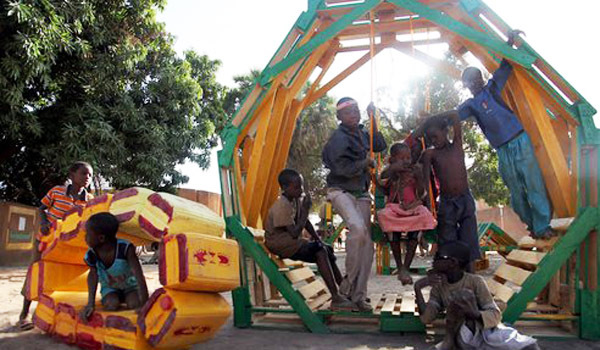 In Niamey, Niger, a Spanish collective called Basurama fashioned this playground out of pallets, tires, garbage bags, and plastic drums. Photo by Basurama via Treehugger. 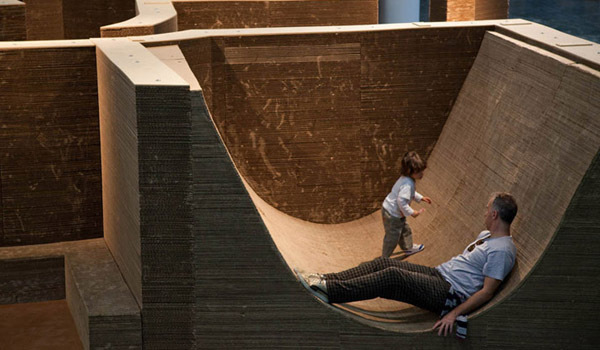 This recycled cardboard labyrinth by Brazilian architect Carlos Teixeira made its first appearance at the 29th International Biennial in Sau Paulo. Photo via Inhabitat (cc). Would you want one of these playgrounds in your neighborhood?